Brad Thompson was one of 13 students nationally to be awarded the $10,000 Graduate Directed Energy Scholarship from the Directed Energy Professional Society. Thompson was awarded for his breakthrough research in low-power directed energy in which a VSCEL array focuses each individual laser diode's energy, creating a coherent directed energy source. Thompson is exploring high power, high brightness VCSEL arrays, which are scaled in 2-dimensions, yielding a much higher power output than traditional VSCELs. Brad Thompson discovered his passion for photonics and optics as an undergraduate after taking the Photonics Device Lab (ECE 495 course) and getting extensive hands-on experience with lasers under the tutelage of ECE Professor Kent Choquette. 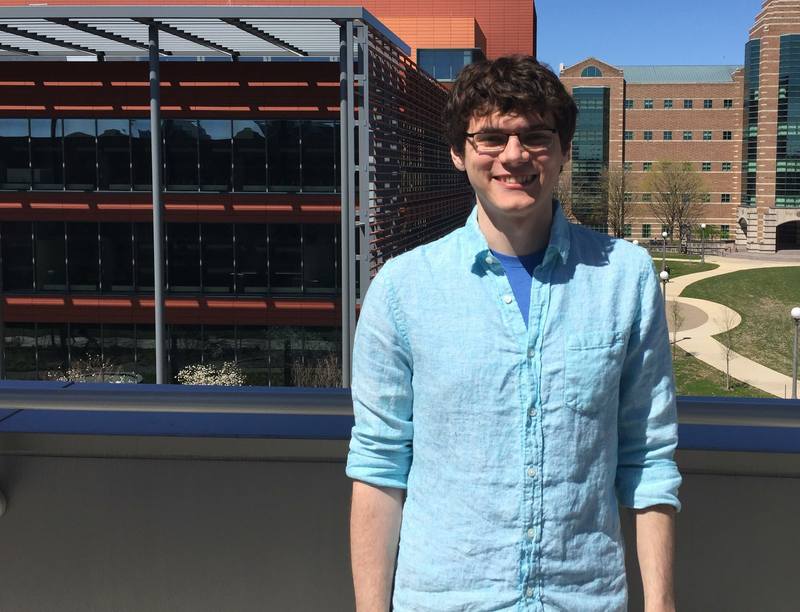 Today, Thompson is a fourth-year graduate student pursuing his interest in vertical-cavity surface-emitting lasers (VCSELs) as a member of Choquette’s Photonic Device Research group. In the fall, Thompson was one of 13 students nationally to be awarded the $10,000 Graduate Directed Energy Scholarship from the Directed Energy Professional Society (DEPS). While traditional applications of directed energy include lasers that shoot down missiles, Thompson was awarded for his breakthrough research in low-power directed energy in which a VSCEL array focuses each individual laser diode’s energy, creating a coherent directed energy source. With an emission perpendicular to the wafer’s surface that can be manufactured simultaneously at a much larger scale and with a more desirable circular emission profile compared with traditional edge-emitting laser’s oval emission, VCSELs are the workhorse of short-distance optical interconnects in data centers, server clusters, and the Internet infrastructure. Thompson is exploring high power, high brightness VCSEL arrays, which are scaled in 2-dimensions, yielding a much higher power output than traditional VSCELs. Specifically, he has developed a new method to electrically tune a VSCEL array to coherence for high brightness applications, providing new flexibility—previous arrays are either incoherent or cannot be tuned. Taking this project one step further, Thompson also had an analog version that modulated music on a laser and sent it over free space. He demonstrated his innovative project at the popular SxSW Austin music festival in March 2016. “The kit with all the source code is on Github,” said Thompson, encouraging others to build upon his ideas. In addition to his research, Thompson has served as a teaching assistant for the popular Theory & Fabrication of Integrated Circuits (ECE 444) course for several semesters, helping the undergraduates learn to fabricate semiconductor devices.